An annual hands-on practical engineering day develops team skills and gives students a real taste of career possibilities. The article describes an innovative project for year 9 (age 13 14) students that has run since 2002 with the help of professional engineers and scientists and incorporates careers information and hands-on practical work. 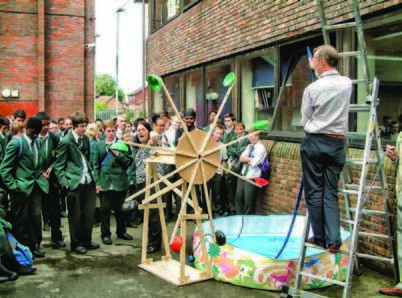 The programme was developed to highlight alternative energy as a subject and also to provide a hands-on practical day for the students prior to making their GCSE examination subject choices. The school's science and technology departments were both involved initially, along with 16 local professional engineer and scientist volunteers. Since the initial project, the school's media department has joined in and the day is seen by the students as an essential and exciting part of the year 9 programme.